This entry was posted in episodes and tagged blu, busta rhymes, copywrite, diplo, episodes, johnson and jonson, kev brown, kip killagain, mainframe, marlena shaw, mf doom, mr fantastic, q-tip, qwel, rjd2, stanza by dex digital. Bookmark the permalink. Oh man.. Skeeter.. Wow.. that was a long time ago. Haha. By the way, there’s news of a live action Cowboy Bebop film coming out. It’s gonna be made by the same guy who directed A Scanner Darkly and they may use Keanu Reeves as Spike Spiegel. Thoughts? Dog, that is what I have been saying about Mr. Fantastik for sooo long. What is up with that guy? So much internet research turning up nothing. He is so sick. Wait, hate to double down, but live action Cowboy Bebop? Keanu? Straight up trying to boycott that. What a travesty?!@?!?! Well.. I don’t know, I’d like to see how it goes.. Personally, I saw Reeves as Vicious but meh. I can’t think of anyone cool enough to suit the role really. At the risk of this turning into a nerd convention (okay who am I fooling, this episode is based on a late 90s cartoon), the prospect of a live action Cowboy Bebop (I haven’t seen the whole thing, don’t ruin it for me) is a little skurry. I don’t necessarily harbor any hatred toward Reeves (Matrix 2 was not good and I never saw 3), but, eh, I don’t know. Did that Dragonball Z movie ever come out? I saw a preview for that and it looked pretty awful. I mean, the Soultronica Series is partially inspired by Cowboy Bebop, so, yeah. I’d have to at least see the youtube preview. It might just be me, but I’m seeing a trend toward US remakes of Japanese films/franchises. Actually, as a random sidebar, the movie Speed was actually a rework of a 70s movie called 新幹線大爆破 – Shinkansen Daibakuha (Bullet Train Big Explosion? something like that). In that version, everyone was trapped on a train that, if dropped below 80km/h or something like that, would explode. Some of the scenes were pretty much exactly the same, too. And, now that I think of it, Keanu Reeves played the lead in Speed, too. BUT, a live action cowboy bebop? why not, as long as Keanu Reeves has nothing to do with that movie! Is it just me or is Keanu the worst actor, like ever? Skeeter would be the blue one. You could look around on youtube for more if you really have some dire need to watch more. wait, Chris – are you actually involved with nation of thizzlam? I definitely have read that blog more than twice. Good stuff. It sounds like you might know more about Mr Fantastic than I do – care to share some details? People really do not like Keanu. You know, it actually occured to me – does anyone know ゴルゴ13/Golgo 13? I don’t know much about it other than that it’s about some ace sniper/hitman that is everywhere in Japan. I’ve seen a couple 70s movie (Japanese, obviously) remakes of it. If it weren’t for the obvious James Bond confusion, I think that would actually be a pretty good candidate for a Hollywood remake. My sister (http://www.myspace.com/starkitten26) and I always said skeeter was black and how much we love us some skeeter. Now Connie was kinda thick, she very well could have been black. Patty Mayonnaise…I mean come on….Mayonnaise? She just had a really deep tan. Her darkness was canceled out by her name, her blond hair, and that (white) southern twang. Dragonball Z live action came out.. to terrible reviews. Yeah, I write for it. I have been listening to this mixtape show longer though. Always posting songs from it. Well maybe I’ll do a little expose on Mr. Fantastik. I tend to obsess over rapper like him. Same with First Degree the DE. He is a rapper out of Sacramento who is super hard body and funny, but also tutors math, so tyt. I’ll send you a link to the post when I am done. it WAS the getaway and you DID call the biggler. and i don’t know if it was as much as we didn’t believe you as it was we never thought of it like that. was patty mayonaise asian? cuz that would explain why i had a crush on her. I been listening to you for what seems like forever. Lovin’ the show keep doing you bro. In the process of listening to the new mixtape now. 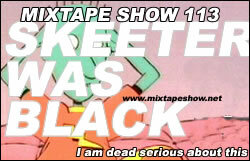 As for Skeeter we all know dude was black. So was Piccolo for that matter. Apparently they’ve pushed the movie back to august ’09. I’m not looking forward this movie at all. Ever since I saw the pre production pictures. It looks like crap. Even more bad news there thinking about making a live action akira as well. All I can say is Hollywood has fucked up again. Haha.. This is ridiculous.. Akira?! Jesus Christ.. the whole reason it’s so appealing is BECAUSE they are anime/manga.. To make it into live action basically defeats the whole purpose of the franchise. Ok ‘m late but…I gotta laugh at the Busta’s impromptu “This sounds like some Fat Albert” quote. He REALLY started the episode . Skeeter being black..hmmmm.I thought he was kinda geeky but I can see him as black, he actually reminds me of friend I have. Anime’s don’t usually translate into films too well. Also, Dex ever heard or Jero ? I heard he’s blowing up in Japan. Serena – okay, I will give you the name thing on Patty. Still, though. Something was up with that female. Connie, I don’t know though – I’d have to watch it again – and not much chance of that happening out here. I’m up on Typical Cats – just never huge on any of it. I had a fairly recent album (or two?) back home, I think. Maybe I missed something, though? supercali – it was, wasn’t it? I actually remember calling my brother, too, who apparently had never thought about it either, but answered in the affirmative. There is no way Patty was Asian. You always come up with the most terrible ideas. Gecko – whoa, slow down on Piccolo – I’m running through the old school series right now (not for fun alone, but to figure out what people around me are talking about when they talk about cartoons they watched as a kid). Incidentally, you all have brought my attention to sort of an interesting phenomenon going on here, which is further incidentally partially related to my research out here. Checked out that link. Just the picture makes me not want to have anything to do with that film. Why is the dude holding a clay Wal-Mart mini jack-o-lantern and wearing a shirt that says “luck” (運) in Japanese on it? Can you imagine rocking a shirt that just said “luck” all over it? Somebody in wardrobe better have gotten fired over that decision. Maybe I’m missing some deeper cultural insight (read: no I’m not), but that looks lame. Brer – oh no question the dude was nerdy as hell, but certainly black. Another question, anyone here watched the ANIMatrix? If you have, was it good? i seen ur pic an u do look a little like Jero but i refuse to believe ur the only light skinned skinny black guy in Japan, animatrix was SICK! Chris Allick – and yes, link me up when you do that post. First Degree the DE is a new name for me – sounds like I should be reading yalls site more. Just a taste. Yeah, he is responsible for a lot of the gang prevention in Sacramento. Genuinely good guy. Also, in my opinion, one of the most next level rappers around. I’ll send you some links to some albums. Maybe you’ll find something mixtapable. Chris youtube is running slow so for some reason I can only see like the first half of that but oh my god. There is clearly genius at work here. I am definitely interested. U HAHAHA seriously i hear that and the immediate reaction is the only daniel bedingfield track that people in the US know. I’ll give you one guess. Haha.. I get thru this man.. That was a killer.. Why did he move onto ballads after? Anyone know? Craig David a big thing over there or not..? That one “CAT” (literally) from Thunder Cats was definitely black too Pantero or something, I didn’t really ever like Thunder Cats so I barely watched. And of course the worst non-black, black man of all Jar Jar from Star Wars…talk about disgrace to the race…that was a low blow from Mr. George Lucas…I mean you already had the golden tokens with Billy Dee and Sammy Jackson…why do you need Jar Jar at all?? U – hey, that was a big tune, nobody can deny that…Craig David though…not to me, anyway. Aush – You know, I don’t really remember that show at all. The He-Man/Masters Of The Universe/GI-Joe type joints I was never really into – I think I actually first heard about Thunder Cats when I was in high school, and by that time it was way too late to get into. Oddly enough I was reading a Japanese translation of Boondocks the other day (700yen at BookOff son!!) where dude was hating on Jar Jar in the same vein. I barely remember that movie – I do remember not liking it, though, and especially not liking Jar Jar. SKEETERS DAD WAS PUERTO RICAN THO SON!